Hey all you 1st through 4th graders! Jump into action and explore science and how it affects the world around us. Join this wild and wacky hands-on class where you will learn about scientific concepts and make and test hypotheses. Some results will be gooey, some fizzy, and some will even be EDIBLE! Example of topics we cover are: density (making “lava lamps”), chemical reactions (making balloons blow up just by using CO2), and physical science (learn about polymers by making bouncy balls!) Each session consists of six 45 minute classes and is taught by Romy Shapiro, a NYS certified teacher with an MA from Columbia University Teachers College. The club is conveniently taught out of Romy’s house in Mt Kisco, NY. 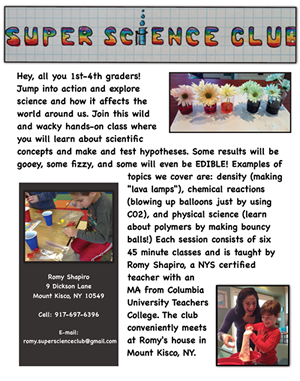 Call 917-697-6396 or email romy.superscienceclub@gmail.com. Visit www.superscienceclub.com.